The bloodlines of waistless furniture can be traced to Chinese wooden architecture of remote antiquity; and if one was to remove the drawers and apron from this mahogany hued coffer, the remaining structure as a form of pillar and beam construction can easily be visualized. The cusped curves on both the apron and spandrels, in subtle contrast with the powerfully splayed legs, give this piece with its architectural origins a striking appearance. The craftsman complements the decorative impact of his design by improvising with his choice of hardware- unusually large, rectangular brass mounts, perfectly proportioned to accommodate the tall drawers and narrow middle panel. A two-drawer altar coffer of similar shape and design with carving on the drawers can be seen in the Victoria & Albert Museum, London. 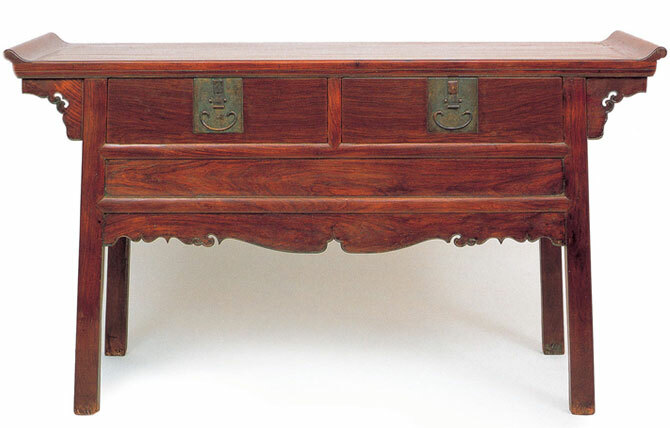 This coffer has been published in Dr. Sarah Handler’s Ming Furniture In the Light of Chinese Architecture pages 172-173.